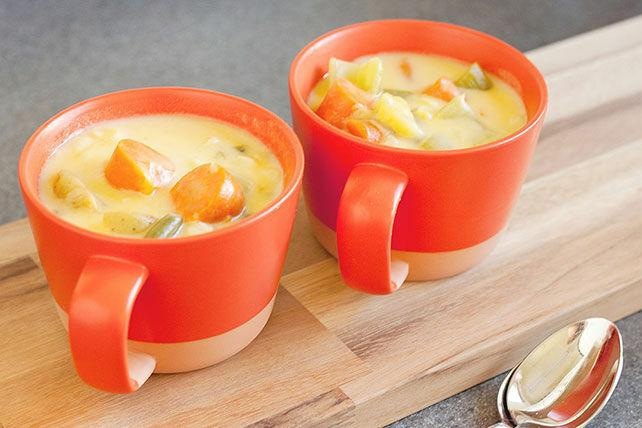 Creamy, homemade cheddar soup is chock-full of assorted frozen vegetables for a substantial chowder. Melt margarine in large saucepan on medium heat. Add flour; stir with whisk until blended. Cook 2 min., stirring constantly. Gradually stir in milk, then water until blended; cook 5 min. or until thickened, stirring constantly. Add cheese; cook and stir 3 min. or until cheese is completely melted and sauce is well blended. Stir in remaining ingredients; cover. Warm up with a serving of this hearty cheesy chowder on a cool day. If you like things spicy, prepare using Cracker Barrel Shredded Habanero Heat Cheese.